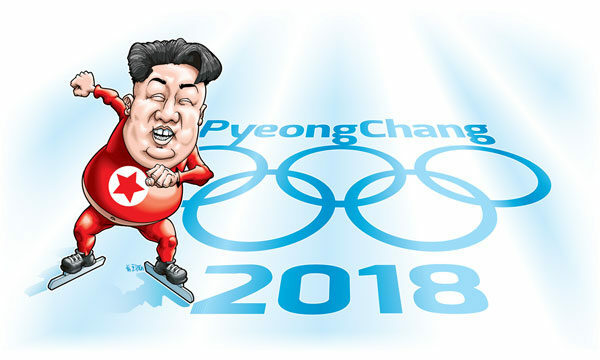 With the 2018 Pyeongchang Winter Olympics beginning February 9, and North Korea (led by their infamous Rocket Man) worming their way into the event, exciting artistic possibilities opened for Ken Dutton’s illustration and caricature services. The two resulting illustrations anchor his latest promotional campaign. Top image – Make skating, not war – and when it comes to fierce rivalries, Tonya and Nancy have nothing on the odd couple of Donald Trump and Kim Jong Un! They’re locked and loaded for a hopefully non-explosive show-down in PyeongChang. 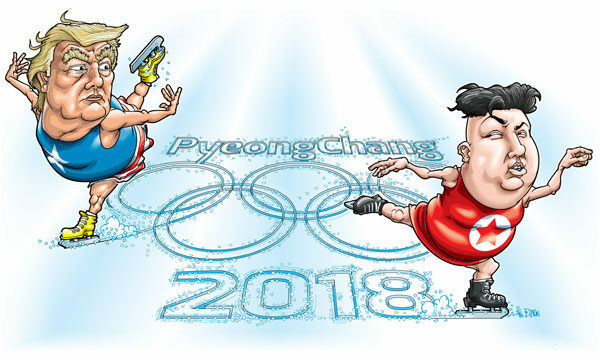 Second image – Using the old “let us in or we’ll incinerate us all” trick to barge into the Pyeongchang Winter Olympics, Kim Jong Un himself is set to demonstrate North Korean speed skating prowess to the world!